Bring the milk to the boil, pour in the cocoa bean pieces and leave in infusion for 5 minutes. Filter through a fine strainer, add the glucose syrup and whisk in a bain-marie to obtain a very thick froth. Rest for 1 minute, remove the froth, pour it into the moulds and chill. Take out of the mould and spray with a 1:1 mixture of cocoa butter and 70% Guanaja plain chocolate. Heat the milk, cream, sugar and egg yolks to 82 °C. Add the gelatine previously rehydrated in cold water. Pour the mixture on the melted chocolate, mix, filter and store in the fridge. After thickening, whisk and store in an icing bag. Add the butter, sugar, flour, cocoa and salt. Pour into a planetary mixer and use the leaf beater to make the crumble. Then pour onto a baking tray and bake at 160 °C for 10/13 minutes. Bring the water to the boil with the salt, add the rice and boil for 24 minutes. Filter, add the cocoa and blend in a Bimby to obtain a smooth, creamy consistency. Spread the mixture thinly onto a sheet of Silpat and dry in the oven at 60 °C for about 6 hours. Take out of the oven and rest at room temperature for another 2 days. Fry for a few seconds in boiling oil at about 200 °C. Place a spoonful of crumble in the middle of the plate and lay two rectangles of frozen milk froth over it. 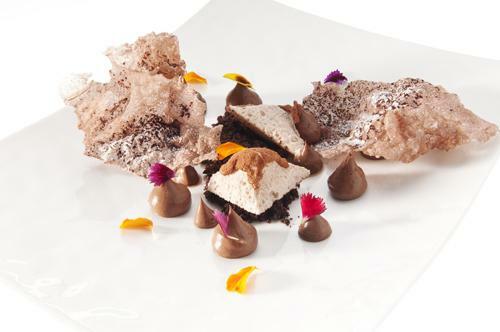 Decorate the sides with dashes of chocolate cream, cocoa rice and edible flowers.